The second issue and fifth issue of Robert Kirkman and Paul Azaceta’s bestselling horror series, OUTCAST BY KIRKMAN & AZACETA, are being rushed to a third and second printing respectively in order to meet escalating customer demand. Due to the huge success in sales, the series is poised to follow THE WALKING DEAD in becoming another entertainment phenomenon with the forthcoming TV series pilot already in development. OUTCAST BY KIRKMAN & AZACETA is sending readers into comics stores everywhere in droves. The chilling series follows a tormented Kyle Barnes—a man with a burdensome gift—and the regularly occurring demonic possessions he encounters. In issue #2, Kyle Barnes is still reeling from the revelations about demonic possession last issue and what they may mean about the time his mother was possessed. In issue #5, Kyle and Reverend Anderson travel further into this world and the true nature of things starts to reveal itself. The truth is more terrifying than they could have imagined. OUTCAST BY KIRKMAN & AZACETA #2 and #5 are also available for purchase across all digital platforms, including the Image Comics website (imagecomics.com), the official Image Comics iOS app, Comixology’s website (comixology.com), iOS, Android, and Google Play. OUTCAST BY KIRKMAN & AZACETA #1, 5th printing is available still with Diamond Code AUG148326. OUTCAST BY KIRKMAN & AZACETA #2, 3rd printing (Diamond Code OCT148181) will be available on 12/17. 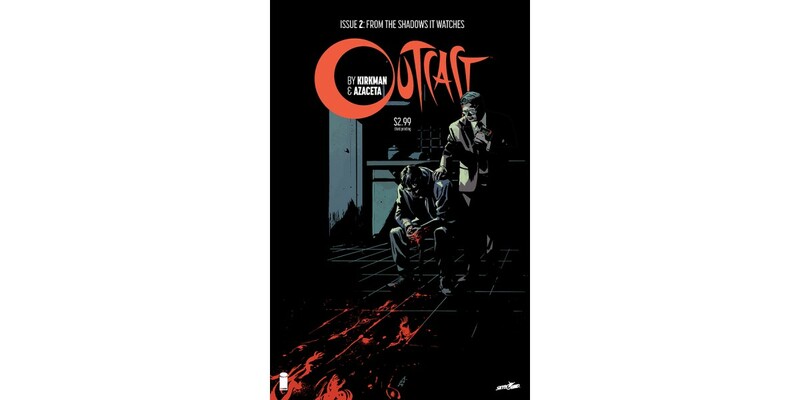 OUTCAST BY KIRKMAN & AZACETA #4, 2nd printing is available with Diamond Code AUG148350. OUTCAST BY KIRKMAN & AZACETA #5, 2nd printing (Diamond Code OCT148182) will be available on 12/17. OUTCAST BY KIRKMAN & AZACETA #6 is available for pre-order with Diamond Code SEP140739. The final order cutoff deadline for retailers is 12/17.